It's the clean and simple - challenge at the Paper Players with beach theme this week. For 6 days, my mind has played a bit too simple, just a blank white paper in front of me and the idea of my last summer days card that I posted a couple of weeks ago. Until today, half way cleaning my car, I got the inspiration. Wonder why.. Here's what I made, and don't take it wrong, it might be simple, but it wasn't easy to make. There's a good few discarded 13x13 cm water colourings at the rubbish bin - one of them actually the favourite of my husband. I coloured the ocean with Salty Sea and Mermaid Lagoon Distress Inks, sprinkled some colour from the brush to add some life and added the die with Joy! Craft's Seashore die. I wrote the text with Distress Marker Broken China. Ahhhhh! Perfectly beautiful, perfectly serene, perfectly CAS! Love this! 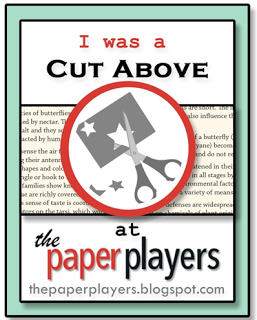 Thanks for sharing this with us at the Paper Players and joining in my challenge! Thank you LeAnne, and thank you for the lovely challenge!